The District of Galicia (German: Distrikt Galizien, Polish: Dystrykt Galicja, Ukrainian: Дистрикт Галичина) was a World War II administrative unit of the General Government created by Nazi Germany on 1 August 1941 after the opening of Operation Barbarossa. Initially, during the invasion of Poland by Germany and the Soviet Union the territory fell under the Soviet occupation in 1939 and temporarily remained in the Soviet hands as part of the Soviet Ukraine. Founded by Adolf Hitler (Document No. 1997-PS of 17 July 1941) with the capital in Lemberg (Lvov), the Galizien province existed from 1941 until 1944. It ceased to exist after the Soviet counter-offensive. District of Galicia comprised mainly the pre-war Lwów Voivodeship of the Second Polish Republic, today part of western Ukraine. 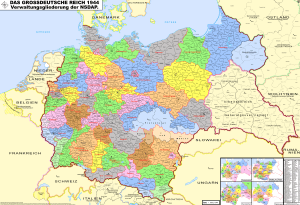 The territory was taken over by Nazi Germany in 1941 after the attack on USSR and incorporated into the General Government, governed by Gauleiter Hans Frank since the invasion of 1939. The region was overtaken again by the Soviet Union in 1944. The district area was managed by Frank's brother-in-law Karl Lasch (de, pl) from 1 August 1941 to 6 January 1942, and by SS Brigadeführer Dr. Otto Wächter from 6 January 1942 to September 1943. Wächter utilised the district capital Lemberg as a recruitment base for the 14th Waffen Grenadier Division of the SS Galicia (1st Ukrainian). In the course of the Holocaust in occupied Poland starting from the year of the invasion, the largest Jewish extermination ghettos were created in Lwów (Lemberg) and in Stanisławów (Stanislau). ↑ Arne Bewersdorf. "Hans-Adolf Asbach. Eine Nachkriegskarriere" (PDF). Band 19 Essay 5 (in German). Demokratische Geschichte. pp. 1–42. Retrieved June 26, 2013. ↑ Paczkowski, Andrzej (2003). The Spring Will Be Ours: Poland and the Poles from Occupation to Freedom. Translated by Jane Cave. Penn State Press. pp. 54–. ISBN 0-271-02308-2. ↑ Dieter Pohl. Hans Krueger and the Murder of the Jews in the Stanislawow Region (Galicia) (PDF file from Yad Vashem.org). pp. 12/13, 17/18, 21. It is impossible to determine what Krueger's exact responsibility was in connection with "Bloody Sunday" [massacre of 12 October 1941 in Stanisławów]. It is clear that a massacre of such proportions under German civil administration was virtually unprecedented.